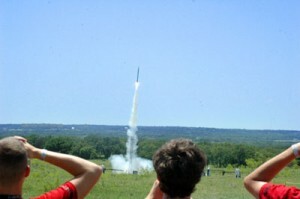 Students from 50 participating High Schools across Texas will gather at Hillview ranch on the Willow City Loop on May 5 thorough 8, to launch 80 rockets they have designed and built as part of SystemsGo Aeroscience studies. First-year rockets will launch one-pound payloads one mile high. Advanced students will launch rockets that exceed the speed of sound. The goal of the program is to promote engineering studies and research, develop work force skills, and encourage students to enter academic and career paths in STEM fields that lead to careers in the engineering industries. Their innovative Aeroscience Studies science, technology, engineering, and mathematics (STEM) curriculum uses inquisitive learning based on a problem- and project-based model to invoke and stimulate skills in design, development, testing, analysis, and innovation. Students experience hands-on research through design and development projects within the engineering industries. Endorsed by NASA and certified by The Space Foundation. For details, visit IgniteEducation.org or call 830-997-3567.